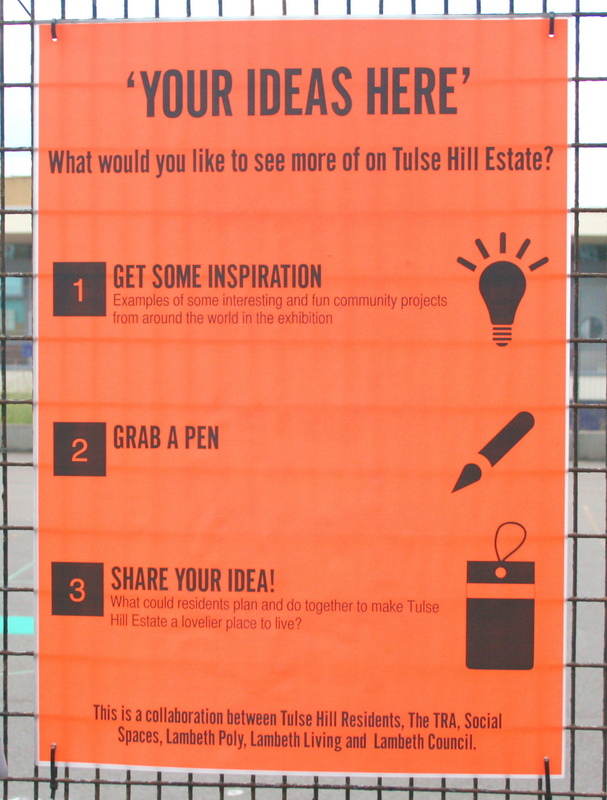 The Tulse Hill estate is full of people with skills and resources, aspirations and ideas; and lots of green and communal spaces. Some people are already very active and neighbourly in the area, others perhaps haven’t had the time or the right opportunity to be involved yet. We are working with the TRA to help surface and link the many assets in the area, through projects that will introduce more people to each other, teach skills, and share resources. 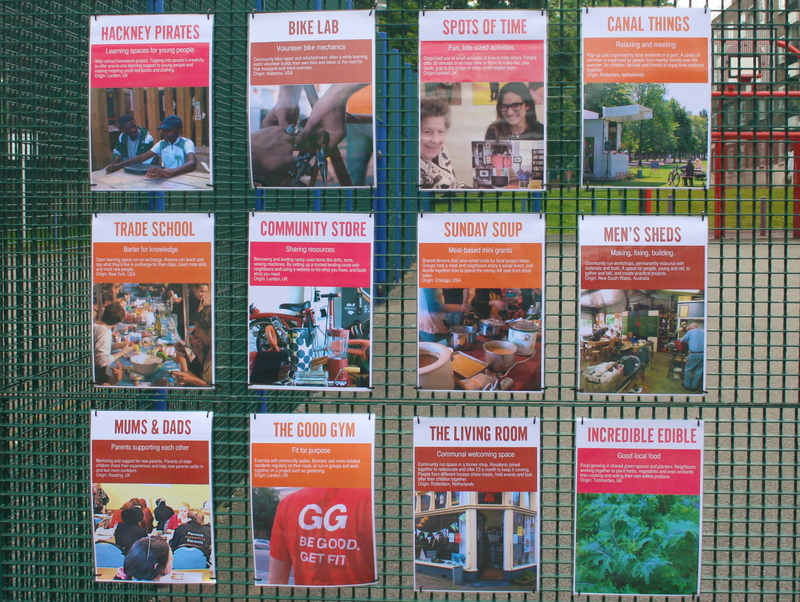 As a first step, we have put up a roving exhibition – featuring inspiring and positive community-led projects from around the world that show the potential to do a lot with a little when many different people are included. 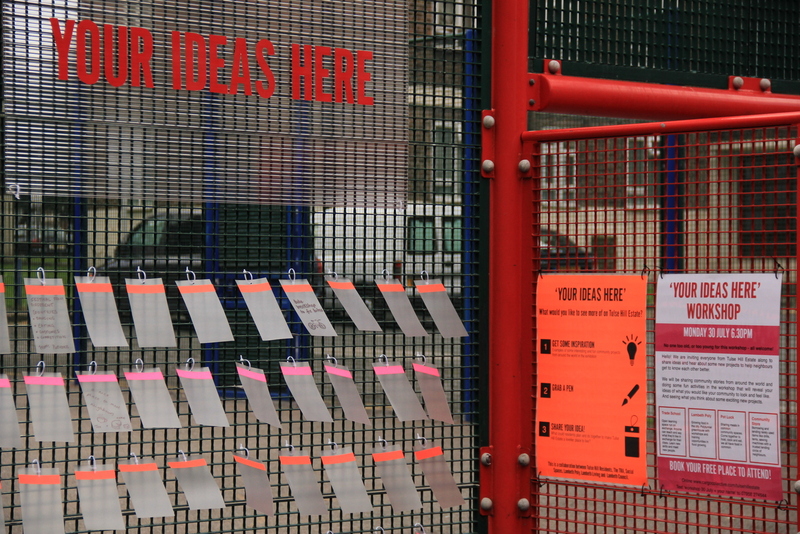 And with a space for people to add their ideas for what they want to see more of on Tulse Hill Estate. While putting up the exhibition we met and chatted to several people living nearby who wandered over to take a look at the posters, and talked through some great ideas for ways to celebrate different cultures through food and dance, and to create sports and outdoor activities for children. 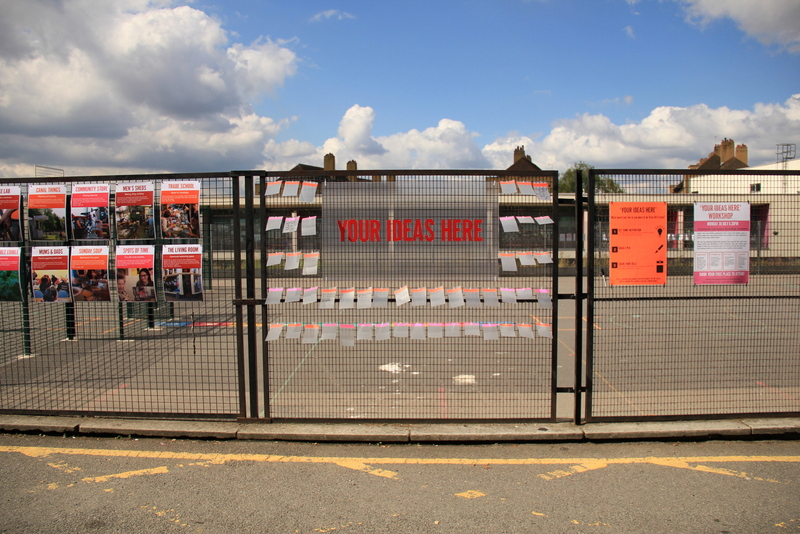 The exhibition will be moving round the estate, offering some positive inspiration and a place to add ideas and create a shared community vision for the type of place people want Tulse Hill to be. We’ll be holding a workshop on Monday 30 July for anyone who wants to find out more. We’ll take you on tour of amazing collaborative projects from around the globe, introduce some new activities, map like you’ve never mapped before, and leave you feeling like you can walk out and change the world! I’m going to use this space to update on projects – so it’s not going to look very strategic right now as I want to capture the detail . Young people are interested in a range of activities including music production, sports, board games and console games. Older young people see themselves as community leaders and may be intested in supporting the younger people. We are arranging a follow-up meeting with the centre management committee to look at a strategic approach to youth provision as well as seeing what we can do to pool resources to start some music and sports activities in the immediate future. We are all very committed to making this work but will try not to raise expectation unrealistically. We need to hear from young women on the estate as they weren’t represented yesterday.